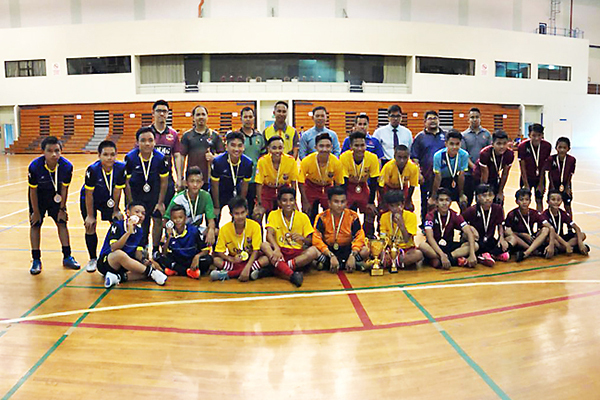 SULTAN Omar ‘Ali Saifuddien College (SOASC) team emerged winners of the Cluster 1 Secondary Schools and Colleges Futsal Championship 2018 after edging Katok Secondary School 4-3 yesterday at the Multi-Purpose Hall of the Hassanal Bolkiah National Sports Complex. Menglait Secondary School drew their matches against SOASC and Katok Secondary School 1-1, to clinch second place through point-based system. Katok Secondary School finished third. Mohd Hilmi bin Sidik of SOASC was named best player. Principal of Menglait Secondary School Osman bin Rajap presented the trophy and medals. The tournament was organised by the Physical Unit of the Co-Curriculum Education Department in collaboration with Menglait Secondary School.